In a city where public restrooms are as rare as an honest politician, answering the call of nature is often tantamount to an emergency, more so for women. 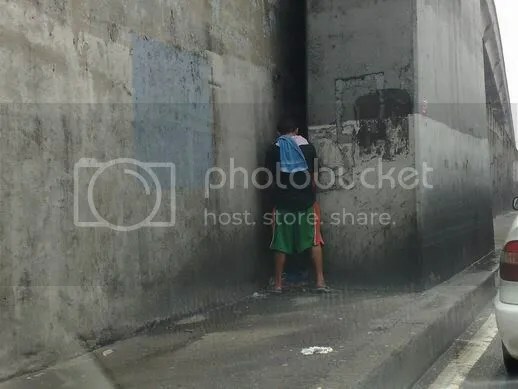 But the lack of accessible restrooms doesn’t seem to be a hindrance for some men, who have no qualms whatsoever when it comes to emptying their bladders even in the most unlikeliest of places, privacy be damned. Like this jeepney driver for instance, who decided to relieve himself — in full view of everyone — while waiting for the traffic light to turn green under the overpass in Cubao. 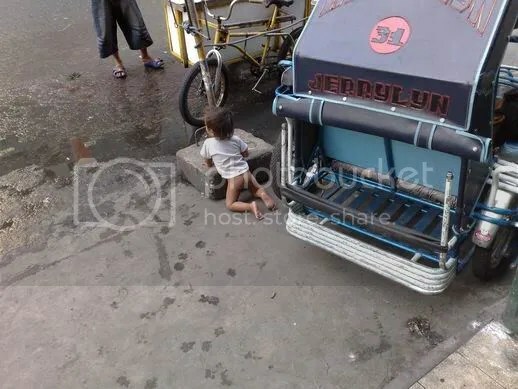 This isn’t an uncommon sight by the way, many such places in Metro Manila have become recipients of countless golden showers — including, unfortunately, many waiting sheds. Last week, I went to see how the world might one day end… at least in the fertile mind of a screenwriter. That I’m a sucker for the mysterious and the unexplained — be it in books, documentaries or movies — is an understatement. I LOVE them, period. So it came as no surprise that my ever so inquisitive self became intrigued with the plot after watching the trailer a few months ago. It thus necessitated the move to break my usual habit of waiting for the movie to come out of tube (yes, I’m one of those unfortunate individuals who have yet to own one of those wide screen LCD beauties), and to watch the world go up in flames in full, glorious CGI-rendered color on the big screen instead. So, was the movie any good? Well, let’s put it this way: What started off as a taut, gripping, edge-of-your-seat supernatural thriller ended up, unfortunately, into one of those cheesy sci-fi fare — usually reserved for B-grade movies — towards the end of the film. I mean, what’s with the aliens/angels thing anyway? Makes you wanna think that the writer adheres to the zany theory of Erich Von Daniken, the Swiss author of “Chariots of the Gods”, best known for his claims of extraterrestrial influences on human culture dating back to the dawn of history. It’s still a good movie, though, well worth the bucks you pay for freezing your buns off inside a giant cooler. Entertaining it certaily is, and at times, provocative (mentally that is) and fast paced enough not to send this moviegoer dozing off into dreamland. 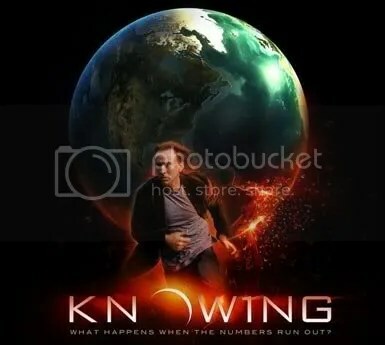 More importantly, it was well acted (though Nick Cage can sometimes be a bit over-the-top, if you know what I mean) and directed, that you’d forget that there is still — despite the threat of global warming —- a world to go back to outside the cinema. It had to happen sooner or later. Ex-president Estrada’s favorite lapdog, I mean… travelling companion, has fnally decided to join the bandwagon by coming up with his own tv ad, extolling his accomplishments and the virtues of his leadership over his beloved little fiefdom, otherwise known as Makati city… which could explain his propensity for nepotism. Accusations of corruption and nepotism aside, some of his supporters claim that his tenure as mayor propelled the city to what it has become today — that of the country’s premier business hub. Man, it’s really sad to see how someone who was once jailed for championing the rights of the oppressed during the Marcos years degenerate into the very person he used to loath. For this overstaying mayor and president-wannabe, the old adage, “power corrupts, and absolute power corrupts absolutely” rings ever so true. One of the two remaining hostages of the Abu Sayaf bandits, Andreas Notter, walked out of the jungle a free man last Saturday. Gaunt, shaken but apparently unharmed. And from the look of things, it was obvious that the Swiss Red Cross worker was released. Senator Richard Gordon, who was able to talk to the ICRC member after his walk to freedom, confirmed this. The military and the defense secretary, however, insist that the hostage was “rescued”. They claim that it was because of the pressure on the bandits — brought about by the military presence in the area — that enabled Notter to go scott-free, hence, the insistence on using the R word. Come to think it, why the hell would his captors “disappear” one by one, if not to let him go? As far as I know, no firefight occurred between the two sides prior to Notter’s release, nor was there any daring, Hollywood-style rescue attempt on the part of the military. Heck, Notter wasn’t even “saved”, but rather, “found” by the troops who were in hot pursuit of the bandits. True, the ongoing operation may have helped, but it still doesn’t qualify as rescue. So why the R word? I’m guessing the military just didn’t want to come out as inutile, or useless. 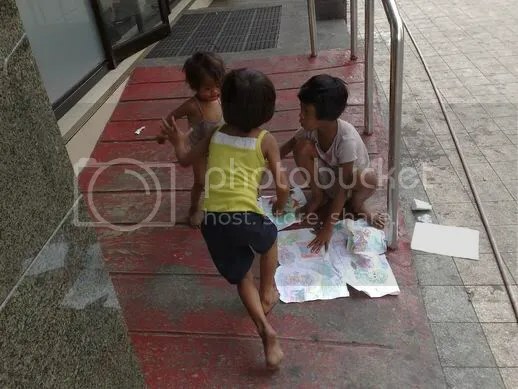 I often come across these group of children playing in front of the building where I park my car. Ill-dressed, smelly and obviously in dire need of a visit to the shower, they are mostly left alone to play amongst themselves — their parents, nowhere to be found. 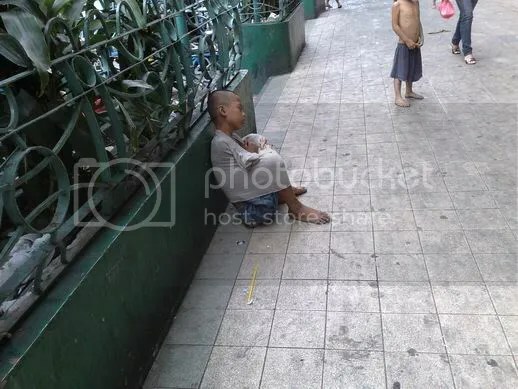 “Nadiyan lang ang mga yun sa tabi-tabi” said the guard when asked where the parents of those children are, who seem not to care whether the little tykes hurt themselves or get hit by a passing jeepney, or cars going in and out of the building’s driveway. 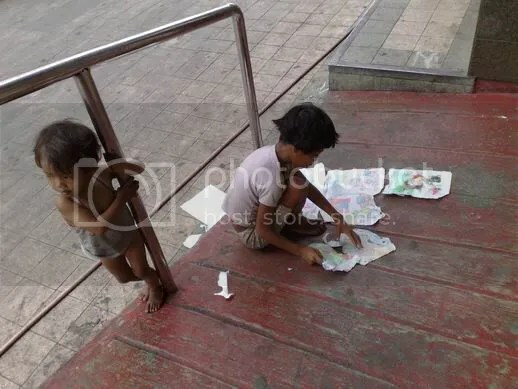 Oftentimes, these children become pests themselves (sorry, I couldn’t think of another word for it) as they ask money from passersby and sometimes, harass customers of the nearby 7-11 as they come out of the convenience store. I’m not sure if the children all belong to one family or not, but if they do then, dang… that couple sure had a lot of time on their hands. I’ve said this before and I’ll say it again, some people aren’t fit to be parents. Heck, they don’t have any right whatsoever having children in the first place. A child is a precious gift from God, so says the church and anti-RH (reproductive health) proponents. I wonder though, if the church and their lackeys realize that a large number of those “gifts” are going to waste out there on the streets. … that’s was how the Gestapo, I mean… the Quezon City Police Department, has been handling the Failon case since day one. And that overkill culminated in what was unmistakably an act of police brutality when — perhaps out of frustration that their investigation was going nowhere — they decided to arrest, without so much as a warrant, practically everyone in the ABS-CBN news anchor’s household (save for his daughters) that included his brother and sister-in-law, who was dragged kicking and screaming out of the hospital where their sister was confined, for “obstruction of justice”. What is more incredible, is that the investigators already put forth a theory — despite the lack of hard evidence — on how the alleged crime was committed, totally disregarding the fact that it could be just that, a suicide. Eh, that’s what you get from watching too many episodes of CSI. Whether guilty or not, everyone is presumed innocent until proven otherwise, or maybe all that was lost on the QCPD when they single-mindedly decided that someone has to fall. And what better candidate for a fall guy than the their harshest critic? 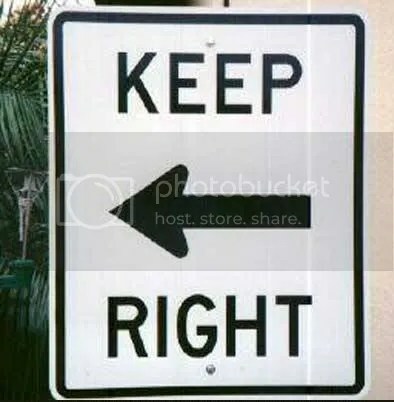 Lesson: Never, never ask a dyslexic to make signs… especially one that involves directions.